Dental surgery is any of a number of medical procedures that involve artificially modifying dentition;in other words,surgery of the teeth and jaw bones. Pulpotomy The opening of the pulp chamber of the tooth to allow an infection to drain;Usually a precursor to a root canal Pulpectomy-The removal of the pulp from the pulp chamber to temporarily relieve pain;Usually a precursor to a root canal. Apicoectomy-A root-end resection.Occasionally a root canal alone will not be enough to relieve pain and the end of the tooth,called the apex,will be removed by entering through the gingiva and surgically extracting the diseased material. Veneers — artificial coverings similar to above,except that they only cover the forward (labial or buccal) surface of the tooth.Usually for aesthetic purposes only. Bridges — a fixed prothesis in which two or more crowns are connected together,which replace a missing tooth or teeth through a bridge.Typically used after an extraction. Implants — a procedure in which a titanium implant is surgically placed in the bone (mandible or maxilla),allowed to heal,and 4–6 months later an artificial tooth is connected to the implant by cement or retained by a screw. Dentures (false teeth) — a partial or complete set of dentition which either attach to neighboring teeth by use of metal or plastic grasps or to the gingival or palatal surface by use of adhesive. Implant-supported prosthesis — a combination of dentures and implants,bases are placed into the bone,allowed to heal,and metal appliances are fixed to the gingival surface,following which dentures are placed atop and fixed into place. 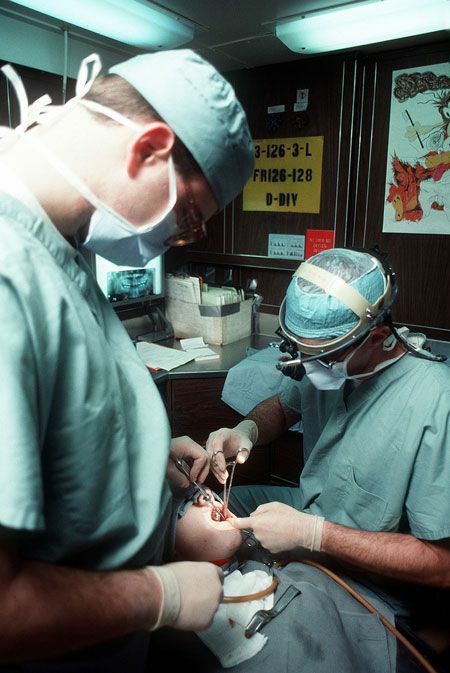 Apicoectomy — also an orthodontic treatment as part of the underlying bone structure must be removed. Extraction — a procedure in which a diseased,redundant,or problematic tooth is removed,either by pulling or cutting out.This procedure can be done under local or general anesthesia and is very common — many people have their wisdom teeth removed before they become problematic. Fiberotomy — a procedure to sever the fibers around a tooth,preventing it from relapsing. Dental hygienist polishing a patient's teeth Regular tooth cleaning by a dental professional is recommended to remove tartar (mineralized plaque) that may develop even with careful brushing and flossing,especially in areas of the mouth that are difficult to clean.Professional cleaning includes tooth scaling and tooth polishing,as well as debridement if too much tartar has accumulated.This involves the use of various instruments and/or devices to loosen and remove tartar from the teeth.Most dental hygienists recommendhaving the teeth professionally cleaned at least every six months. Previous:How to detect anesthesia machine leakage?